Then listen to Prof. Coe’s delightful history of chocolate starting as currency among the Maya before becoming a drink for European kings and aristocrats. Yale Professor Emeritus Michael D. Coe is an American archaeologist, anthropologist and author. He is world famous for his research and publications on the Maya, the Olmec, and pre-Columbian Mesoamerica. Prof Coe is also Curator Emeritus of the Anthropology collection at Yale’s Peabody Museum of Natural History. He is co-author of The True History of Chocolate first published in 1996 with his wife Sophie D. Coe. 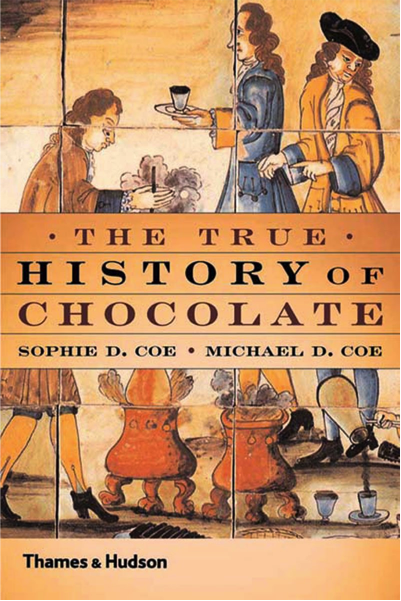 Cultivated by slaves, consumed by the elite, paid out as a tribute to conquerors, this delightful tale of one of the world’s favorite foods draws upon botany, archaeology, socio-economics and culinary history to provide a complete and accurate history of chocolate. It begins some 4,000 years ago in the jungles of Mexico and Central America with the chocolate tree, Theobroma Cacao, and the complex processes necessary to transform its bitter seeds into what is now known as chocolate. This was centuries before chocolate was consumed in generally unsweetened liquid form and used as currency by the Maya and the Aztecs. When chocolate was introduced to Europe, it first became the drink of kings and aristocrats and later was popularized in coffeehouses. Chocolate became available to all in the nineteenth and twentieth centuries as a result of industrialization.